Gorm is a Nord warrior and the housecarl for Idgrod Ravencrone, the Jarl of Hjaalmarch. He wears a set of studded armor and a pair of hide boots. He is equipped with an iron mace and carries a selection of common loot and gold. He wakes up early in the morning, at 6am. He immediately gets to work standing guard for Idgrod and stays with her for the next twelve hours. At 6pm he leaves Highmoon Hall to head for the Moorside Inn for dinner. After three hours at the inn, he heads back to Highmoon Hall where he finally goes to sleep at 11pm. However, if the Stormcloaks take Hjaalmarch, he'll be permanently relocated to the Blue Palace where he'll stay in the basement twenty-four hours a day. When you meet him in the hall, he will be completely focused on his job, remarking, "I'm just here to protect the Jarl, not to chat." or "Morthal has enough problems without you bothering me." or "I'm under a lot of pressure. If you don't leave me alone, I won't be held responsible." He also seems to only care about Morthal, saying, "Morthal doesn't need any trouble. You keep your nose clean, understand?" When you first converse with him in Highmoon Hall, he will be very straightforward on how he wants the jarl to be treated, saying, "You will not disrespect Jarl Idgrod while in this Hall. Do we have an understanding?" If you say that you do, he'll be pleased, saying, "Then by all means, go about your business." If you say that people don't tell you what to do, he'll be annoyed, saying, "No? Then how do you like the idea of having your legs broken? Mind your manners in this hall, friend." 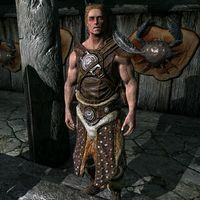 If you ask why you would disrespect the jarl, he'll explain, "It's no secret that Jarl Idgrod is... different. It's also no secret that there are rumors about her and her visions. I won't repeat them, and I won't allow them to be spread under this roof. Now, you go about your business." When you meet him outside of Highmoon Hall, he'll act differently, saying, "My mind weighs heavy enough. Leave me to my food." If you ask him what's wrong, he'll carefully try to explain, "She's so lost in her visions, and it's only getting worse. I've looked after her safety for so long... If she can't tell what's real and what's not, how will she continue to lead Hjaalmarch?" When you ask if you can help, he'll respond affirmatively, "Yes, I suppose there is. There is a letter, one I have had for some time now. I think it is time it gets delivered. I cannot leave Idgrod's side, so I must stay here. Could you see that it reaches Captain Aldis in Solitude?" If you decline, he'll say, " I understand." If you offer to help later, he'll act paranoid but pleased, asking, "Yes, but... not so loud! Will you take it to Captain Aldis?" If you agree then he'll be grateful, saying, "Thank you. Please, do not open it. It is... private." If he gets forced to the Blue Palace when the Stormcloaks take Hjaalmarch, he'll be depressed, remarking, "Leave Idgrod and her family alone. They've been through enough." or "This wasn't what I wanted. Not at all." or, lastly, "All that ever mattered was what was best for Morthal. Leaving it in Ulfric's hands... It's not right." According to Joric, Gorm thinks Joric's crazy, saying, "Gorm thinks I'm mad. He doesn't say it, but I know he thinks it. Is he right?" Idgrod: "The visions continue to hold me in balance, Gorm." Idgrod: "Do not worry, my friend. All is well." Idgrod: "You are troubled, Gorm." Idgrod: "No, Gorm. I am simply telling you what I see." Gorm: "Buy you a drink?" Benor: "Not right now. Anything new?" Gorm: "Still the same. I tell you, something's got to be done." Benor: "When the time is right, friend. When we're sure." Gorm: "The longer we wait, the worse it gets." Benor: "Let's talk about it some other time." Alva: "Would you like to buy a lady a drink?" Gorm: "What would Hroggar say if he heard I was drinking with you?" Alva: "Forget about Hroggar. He's always so tired lately. I need someone with a little fire in their blood." Gorm: "After all you've put that man through. You should be more loyal to him." This page was last modified on 3 May 2018, at 22:52.